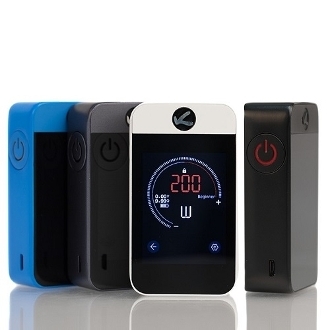 The Pollex is the new state-of-the-art Mod Battery from Kanger Tech. It has an internal 3500mah battery and uses a micro USB for charging. It has a wattage output range of 1-200W and a temperature range of 200-600F as well as a minimum atomizer resistance of 0.1ohm. The Pollex Box Mod has some great protection features as well: Low Resistance Protection, Atomizer Short Protection, High Temperature Protection, Low Power Protection, and Over Time Protection. It supports Ni200 Nickel, Titanium, and Stainless Steel coil heads. It has a Large 2.4" OLED Touch Screen that is user-friendly and 3 selectable modes; soft, normal and hard. It is available in Black, Blue, Gray and White. No need for mechanical adjustment with touch screen. Various working modes to choose from. Works with 4 different languages. Comes with 4 changeable wall papers. Has a self-defined temperature control curve. From the Main Menu the OLED shows power, resitance and voltage. The user can adjust the power by pressing the plus or minus signs. The mode setting lets you change language and patterns as well as choose level of expertise. Click the Setting button on the top right corner and get into the DISPLAY interface. The user can adjust the screen brightness, choose to lock the screen, turn off the device and restore factory settings.